Call the family and mark your calendars! Holiday time is fast approaching and we have got the entire list of programs ABC Family has got on deck... like "deck the halls" - see what I did there? On deck for it's annual "25 Days of Christmas" event! It's fun for the entire family! Take a look! 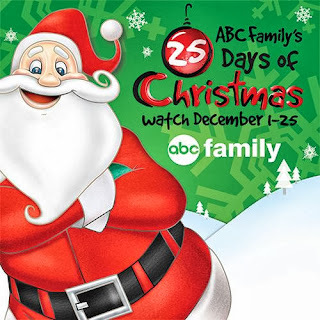 ABC Family’s annual “25 Days of Christmas,” cable’s biggest programming event of the year, will return with 25 continuous days of holiday-themed entertainment for the whole family. From December 1–25, viewers can ring in the holidays with original movies, holiday specials and returning favorites. This year, “25 Days of Christmas” will feature the world premiere of the ABC Family original movie, “Holidaze,” starring Jennie Garth (“Beverly Hills, 90210”) and Cameron Mathison (“All My Children”). Premiering Sunday, December 8 (8:00–10:00 PM ET/PT), “Holidaze” follows Mel (Garth), a high-powered executive who is sent back to her hometown to convince its residents to allow her company to build a new discount store. The townspeople—led by Mel’s former fiancé Carter (Mathison)—are vehemently opposed to it. Desperate to get out of town and back to her “real” life, Mel takes a spill and wakes up in an alternate universe where she never left home and is married to Carter. Once determined to leave her small town life behind, Melody must make sense of her new life and decide if you truly can go home again. The celebrations continue with the holiday-themed premieres of ABC Family’s hit comedies, “Melissa & Joey” and “Baby Daddy,” airing Wednesday, December 11 (8:00–9:00 PM ET/PT). Making their ABC Family debuts this month are “Deck the Halls” on Wednesday, December 4 (10:00 PM–12:00 AM ET/PT), “Winnie the Pooh” on Saturday, December 14 (8:00–9:30 AM ET/PT) and “Disney’s The Little Mermaid” on Saturday, December 14 (8:00–9:45 PM ET/PT; Encore Presentation 9:45–11:30 PM ET/PT). A new generation of viewers can enjoy the Rankin Bass holiday classics, such as “Rudolph’s Shiny New Year” Thursday, December 5 (6:00–7:00 PM ET/PT), “Frosty’s Winter Wonderland” Friday, December 6 (6:00–6:30 PM ET/PT) and “The Year Without a Santa Claus” Tuesday, December 10 (9:00–10:00 PM ET/PT). Other returning favorites include “Dr. Seuss’ How The Grinch Stole Christmas,” starting Sunday, December 1 (7:00–9:30 PM ET/PT); “The Santa Clause” films, starting Monday, December 2 (8:00–10:00 PM ET/PT); “Scrooged,” starting Tuesday, December 3 (8:00–10:00 PM ET/PT); “National Lampoon’s Christmas Vacation,” starting Tuesday, December 3 (10:00 PM–12:00 AM ET/PT); “The Polar Express" Thursday, starting December 5 (7:00-9:00 PM ET/PT); and “The Muppet Christmas Carol,” starting Thursday, December 5 (9:00-11:00 PM ET/PT). Steve (Matthew Broderick) gets into an increasingly absurd war with his new neighbor Buddy (Danny DeVito), when Buddy decides to decorate his home with enough Christmas lights to be seen from space. High powered executive Melody Gerard (Jennie Garth) returns to her sleepy hometown to try and convince everyone to let her company build a giant new discount store. But she’s unexpectedly met with resistance by the townspeople—led by her childhood sweetheart, Carter (Matheson). Desperate to get out of town and back to her “real” life, Melody takes a spill and wakes up in an alternate universe where she never took the job and is married to Carter. (10:30–11:00 PM ET/PT) DISNEY·PIXAR’S TOY STORY OF TERROR! Mermaid Ariel dreams of seeing the world above the sea. Fascinated with humans, she saves a shipwrecked Prince Eric and sings him to back to health. Desperate to see him again, Ariel makes a bargain with sea witch Ursula that would allow her to be human—but it strips her of her voice. She has three days to find Prince Eric and receive true love’s kiss—or she’ll be sent back to the sea and belong to Ursula forever.